Small volumes of anti-CDK1 antibody vial(s) may occasionally become entrapped in the seal of the product vial during shipment and storage. If necessary, briefly centrifuge the vial on a tabletop centrifuge to dislodge any liquid in the container`s cap. Certain products may require to ship with dry ice and additional dry ice fee may apply. Western blot analysis of extracts of various cell lines, using CDK1 antibody at 1:1000 dilution. 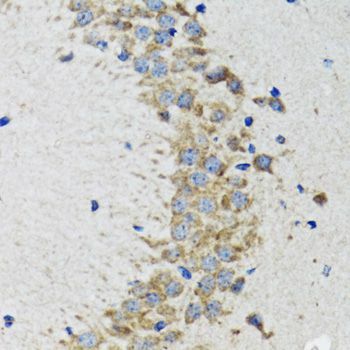 Immunohistochemistry of paraffin-embedded rat brain using CDK1 antibody at dilution of 1:100 (40x lens). 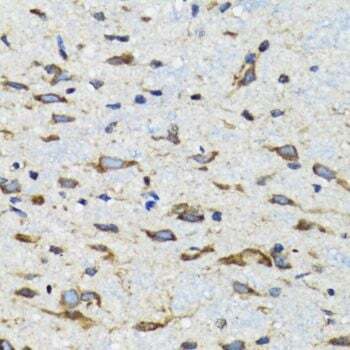 Immunohistochemistry of paraffin-embedded mouse spinal cord using CDK1 antibody at dilution of 1:100 (40x lens). 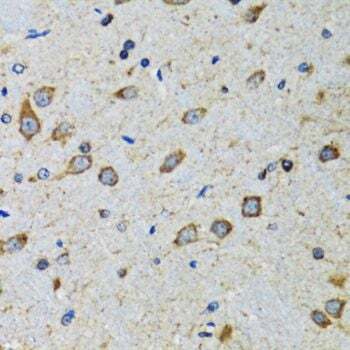 Immunohistochemistry of paraffin-embedded mouse brain using CDK1 antibody at dilution of 1:100 (40x lens). 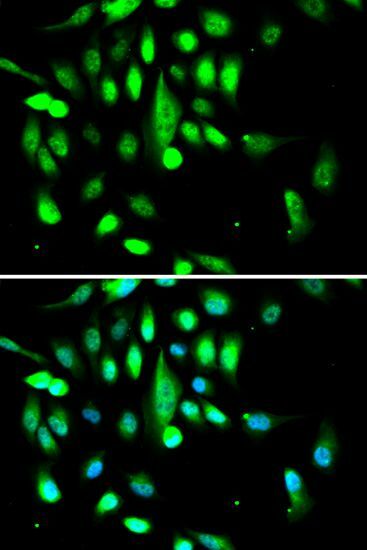 Immunofluorescence analysis of A549 cells using CDK1 antibody. Blue: DAPI for nuclear staining. NCBI/Uniprot data below describe general gene information for CDK1. It may not necessarily be applicable to this product. CDK1: a protein kinase of the CDK family. Catalytic subunit of the conserved protein complex known as M-phase promoting factor (MPF), which is essential for G1/S and G2/M phase transitions. Mitotic cyclins stably associate with this protein and function as regulatory subunits. Its activity is controlled by cyclin availability and phosphorylation through the cell cycle. Activated in many cancers including colon, liver and breast. 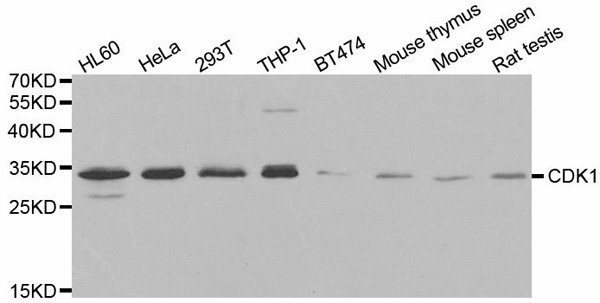 The T isoform, which lacks a regulatory region, is expressed in breast cancer. Inhibition in cancer cells may drive cells into apoptosis. May also drive cell migration. Inhibitors: BMS-265246, BMS-265246-01. 2 isoforms of the human protein are produced by alternative splicing. 1. ATR stabilizes the CDKN1A message in response to UV damage through Cdk1-related cytoplasmic accumulation of HuR.